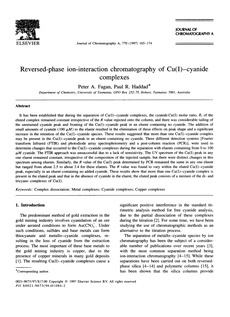 It has been established that during the separation of Cu(I)-cyanide complexes, the cyanide:Cu(I) molar ratio, R of the eluted complex remained constant irrespective of the R value injected onto the column, and there was considerable tailing of the unretained cyanide peak and fronting of the Cu(I)-cyanide peak in an eluent containing no cyanide. The addition of small amounts of cyanide (100 μM) to the eluent resulted in the elimination of these effects on peak shape and a significant increase in the retention of the Cu(I)-cyanide species. These results suggested that more than one Cu(I)-cyanide complex may be present in the Cu(I)-cyanide peak in an eluent containing no cyanide. Three different detection systems [Fourier transform Infrared (FTIR) and photodiode array spectrophotometry and a post-column reaction (PCR)], were used to determine changes that occurred to the Cu(I)-cyanide complexes during the separation with eluents containing from 0 to 100 μM cyanide. The FTIR approach was unsuccessful due to a lack of sensitivity. The UV spectrum of the Cu(I) peak in any one eluent remained constant, irrespective of the composition of the injected sample, but there were distinct changes in this spectrum among eluents. Similarly, the R value of the Cu(I) peak determined by PCR remained the same in any one eluent but ranged from about 2.5 to about 3.4 for these eluents. The R value was found to vary within the eluted Cu(I)-cyanide peak, especially in an eluent containing no added cyanide. These results show that more than one Cu(I)-cyanide complex is present in the eluted peak and that in the absence of cyanide in the eluent, the eluted peak consists of a mixture of the di- and tricyano complexes of Cu(I).